Soul music has been my biggest pre-occupation in life for as long as I can remember. I owned my first Soul record when I was nine years old - Archie Bell and the Drells - 'Here I Go Again', which I was given on my birthday. I was brought up in a very musical family, and was constantly surrounded by the sounds of records (or the piano) being played. My Dad worked in the music business as a producer and arranger, and had his name on a number of Top 10 British pop records during the 1960's and 1970's, with groups such as Chicory Tip, Vanity Fare, and even the Northern Soul tune by Paula Parfitt - 'Love Is Wonderful' I have happy childhood memories of my two teenage sister's nightly records sessions in the living room. The furniture would be pushed back out of the way, and there'd always be an hour or two of favourite tunes on labels such as Tamla Motown, Bell, Buddha, and Atlantic, as well as Trojan and Island. I must admit to being musically distracted for a while, thanks to the likes of punk and new wave, but even within that there were plenty of links to black music, eg. The Clash - Police and Thieves (a remake of Junior Mervin's reggae classic). Short haircuts, earrings, vaguely outrageous clothing styles are pretty normal these days, but in the late 1970's it often managed to earn one a few snidey comments, as there was usually someone about who managed to take exception to anything 'different'. By the time I was coming up to leave school, I figured that if I wanted to get a job (and my fair share of girls) then I'd better take a change in direction. In 1979 we'd moved house to the south of London, to an area where the big local hobby was going to a venue called Tiffany's in Purley, where all-day 'Soul Festivals' would take place. By strange coincidence, the smartest looking people at the time all claimed to be fans of Soul music, and would spend weekend evenings posing at clubs and discos where this music was allegedly played. I remained quite unconvinced by what they would describe as 'Soul', which generally sounded like some machine-generated dross with an incessant disco beat. Being keen on pirate radio, I would spend Sunday afternoons listening to a station called Radio Invicta. They certainly played Soul, but nothing like the rubbish I'd hear out and about at parties and youth clubs. This sounded different, and featured saxophones and guitars, often coupled with soulful vocals, or sometimes in purely instrumental format. This was often referred to as Jazz Funk (a term which I used to think sounded quite naff). You could dance to this stuff though - it was just brilliant ! So it's summer/autumn 1980. I've left school, got some money in my pocket, been down to the Whitgift Centre in Croydon to buy myself some baggy jeans and a stripey top, and am finding myself scraping the surface of the lesser known world of 'real' Soul music. I'm suddenly finding out about Robbie Vincent's show on Saturday mornings (Radio London - 11.30 'til 2.00), publications such as Black Echoes, and nights out at clubs such as The Lyceum, The Royalty, and going to my first 'big' event - an all-nighter at Tiffany's in Stevenage, Herts. The big tunes that night included Light of the World - 'Time', The Dells - 'All About The Papers', Willy Beaver Hale - 'Groove On', and William De Vaughn - 'Be Thankful For What You've Got'. By early 1982 I'd attended my first Caister Soul Weekend, but the type of 'feel' that had originally attracted me to this music - well produced string orchestrations on labels such as Philadelphia International, and intuitive musicianship from the likes of trumpeter Tom Browne - was starting to disappear, to be replaced with a harder-edged electronic sound. There may be those who regarded Grandmaster Flash - 'The Message', and Soul Sonic Force - 'Planet Rock' as being responsible for turning funk and dance music on it's head, but I figured that you might as well listen to Black Sabbath if you wanted your music to sound angry. The music I loved seemed to be rapidly disappearing out of the window. My weekly written dose of Soul music came via Black Echoes magazine, which always featured a couple of pages dedicated to Northern Soul. To be honest, no one round our way really knew much about this, or even what it sounded like, but we were told that it was basically unheard of 60's Soul music, with a driving danceable beat. I just had to find out more. In January 1983 I attended my first Northern Soul all nighter. The venue was The 100 Club in Oxford Street, and from hearing the first record, I just knew I was hooked. This was real Soul music, and there was loads of it to be heard. The problem was, as fantastic as this music was, you just couldn't get to hear it anywhere except at all nighters, and most of these weren't anywhere near London. The records were impossibly hard to find. They could be purchased via mail order for hugely inflated prices, but the mail order lists contained hundreds of titles, it was guesswork as to what was any good and what wasn't, and trying to remember the name of that tune you'd heard played just once at 3am in a busy club became maddeningly frustrating. The solution to this quandary came via compilation LPs released by Kent Records, with titles like 'Floorshakers', 'For Dancers Only', and 'Soul Spin'. Suddenly, all these unheard of tunes were easily and affordably available. By late 1985 I'd settled down with my girlfriend and baby daughter, so compilations became a necessary and indispensable way for me to follow the music I loved, seeing as going out to clubs was definitely 'off the menu' for a while. Fast forward to 1999. My daughter is now a teenager, my wife is back at work, I'm in a well-paid technical job with a broadcasting company, and we can afford to go out enjoying ourselves again. I'm browsing the Internet at work one day, and decide to see if there's anything on there about Northern Soul (I'd assumed that it had long since been forgotten about). To my surprise, the scene appeared to be in a state of revival, and a lot of this was happening right here in London. I soon found myself getting out to clubs once again, and the music sounded better than ever. Thanks to the Internet, one was now able to acquire electronic sound files of records, and in the space of a few months I'd acquired several hundred 'new' tunes. This revival wasn't just confined to Northern Soul. 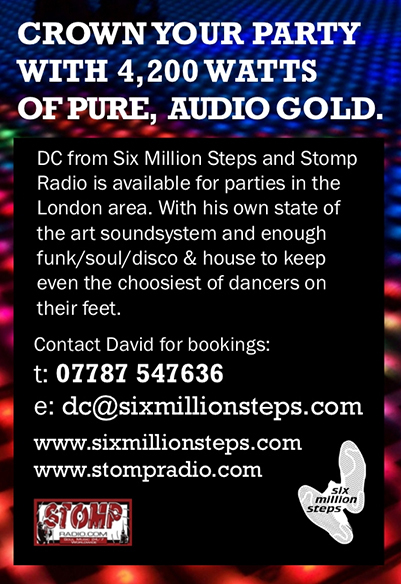 The mainstream Funk movement which I'd been such a part of was also picking up steam once again, with regular club nights, and even weekenders. The fact that obscure tunes were now easily accessible (via MP3) meant that I'd soon completed my wants list, and (even better) was hearing superb 'new' tunes that had been sitting forgotten in dusty record sleeves for decades. Chat lists and email meant that like-minded folk could easily make contact and share their interests, and that's how I came to know my fellow colleagues here at Six Million Steps.